The wave of consciousness about health and what we put in our bodies extends more than just our species. Dog owners are also becoming more and more aware of the number of chemicals their canine pets ingest daily. 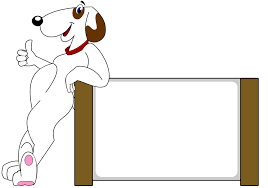 Since dogs always eat more or less anything you place in their bowl, it’s absolutely up to you to be the responsible dog owner and feed your dog nutritious meals. 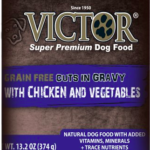 With this in mind, many dog owners have turned to Victor Dog Food, a choice that has become popular throughout the country for a number of reasons. In this review, we will take a look at this brand in further detail. 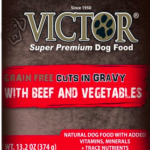 Victor dog food is produced by Mid America Pet Food LLC. 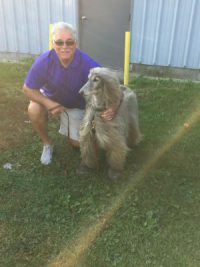 This small company is based in Texas, which is also where the pet food is manufactured in their custom-built facility. 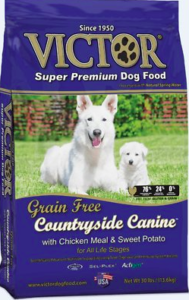 Apart from dog food, they also produce Victor branded cat food products and horse feed. Victor has its roots as a brand name sometime in the mid-1940s; however, the goods available today has only been in existence since 2007. 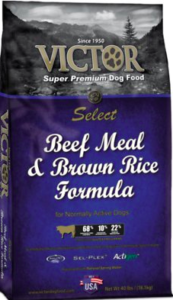 In the span of Victor’s existence since its inception (2007), the dog food company has not had any publicly reported recalls for any incident whatsoever. 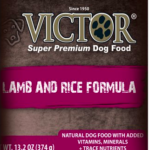 Checking both their online presence and FDA recall database, both Victor and even Mid America Pet Food has a clean record. 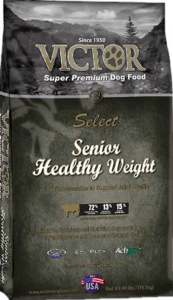 Victor gives consumers a fair selection of what it calls “Super Premium” pet food. They usually make dry kibble but have lately combined a small range of wet, canned food. Blends appropriate to target many nutritional requirements are available, including a lot of grain-free blends. Victor reports putting only the necessary ingredients in their food to ensure that nutrition is their primary priority. With most of their ingredients sourced locally, Victor produces good products with high-quality ingredients that are free from corn, wheat, soy, gluten and most GMOs (genetically modified organisms). These products make it good for those mindful of what they’re feeding their dogs. Victor does not add extra chemicals in their formulas, such as unnatural colors, flavors, and preservatives. The majority of Victor’s ingredients look to include three meat-based constituents in the first five ingredients, which is good. 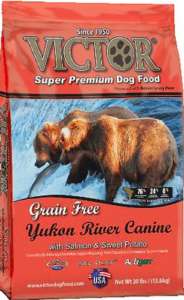 Each of Victor’s recipes (except for Yukon River Canine, which contains salmon) contains beef meal as their main protein source. While this ingredient may look unconvincing, it is a meat concentrate that contains nearly 300% more protein than fresh beef. 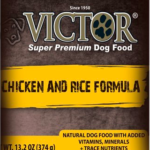 Victor contains good-quality, named fats, which include chicken fat, flaxseed, and canola oil (used in the Yukon recipe instead of chicken fat). These all give your dog the nutritious fats that help keep her skin and coat healthy, as well as giving her a good source of energy. 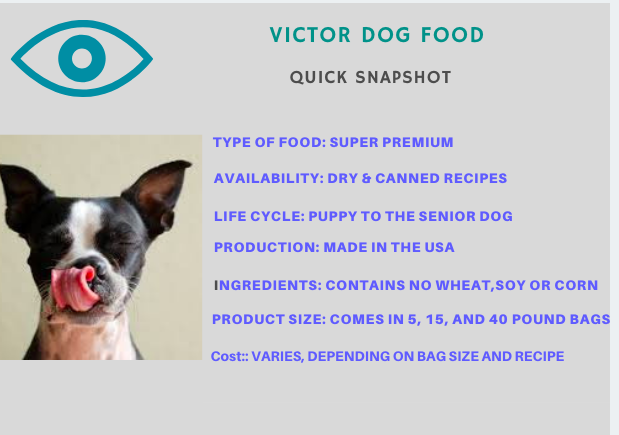 Victor’s regular recipes usually have two of the following carbohydrates sources: grain sorghum, whole grain millet, feeding oatmeal, and whole grain brown rice. These are all healthy, whole grain sources of carbohydrates for your dog, which has a lot of fiber and vitamins. Victor’s grain-free recipes have sweet potatoes and peas as instead of grains. These are both premium grain-free alternatives, as they not only provide carbohydrates but also has lots of antioxidants as well. Most of Victor’s recipes have moderately low levels of carbs. In the regular, lower-protein formulas, however, the number of carbs can rise to almost 50% due to the addition of more grains. Although the Victor brand does not include a wide variety in the canned or wet recipes, here is a list below to give you a number of options. Simply click on a specific can below to gain further insight on each specific recipe. 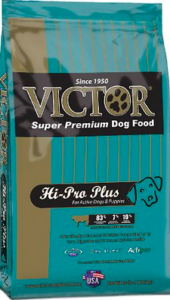 In conclusion, with all things considered, Victor has an extremely comprehensive collection of dog food products that offer many choices for the responsible dog owner. The collection has enough alternatives in terms of flavors and nutritional requirements for you to choose which is best for your dog. In reviewing this product, I was more impressed with what these recipes don’t contain as I was with what the recipes do contain. I strongly believe that ingredients such as corn, wheat, soy, and gluten serve little to no nutritional value and have no place in our pet’s diet. 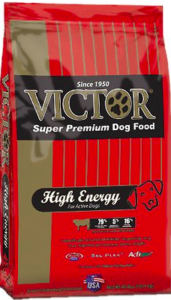 I also like the amount of healthy protein associated with the Victor product as well which is essential in providing our four- legged companions with a source of quality energy. 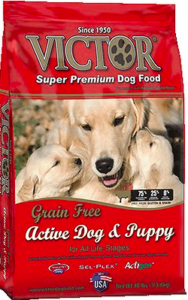 In addition, the Victor brand accommodates dogs throughout their life cycle (puppy to senior) which eliminates the process of transitioning from one brand to the next. Finally, I give this product a: 4 1/2 out of 5 and one I would strongly consider.